STAR actively supports those Shipyard artists who introduce students from the Bayview/Hunters Point and beyond to the fun and creativeness of art. Some teach art in public schools. One Shipyard studio becomes the "Art Rocks clubhouse" on Saturdays (external link to the Shipyard Artists website). 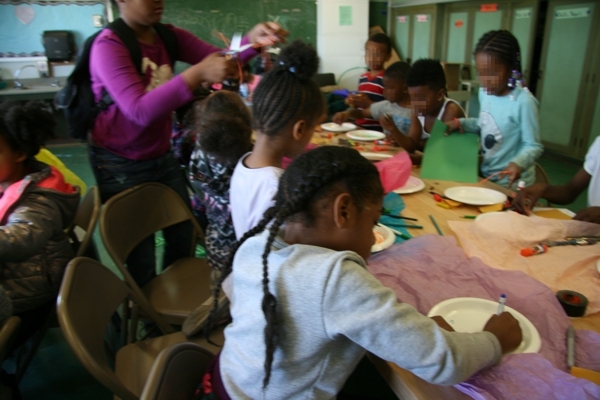 In partnership with YMCA Urban Services, Bayview Opera House, SCRAP, and the San Francisco Unified School District, STAR provides a Shipyard artist and art supplies for a weekly after-school art class. The program runs for the entire school year. Five classes led by different shipyard artists taught 40 kids from the Charles Drew Elementary school about different aspects of visual art in the summer. STAR is very pleased to have partnered with the Urban Services YMCA, supported by a grant from the Hunters Point Shipyard developer FivePoint, to offer this series of five classes to the community. STAR matches skilled teaching artists at the Hunters Point Shipyard with Bayview Hunters Point organizations that want to offer art classes to their members or the public. In 2017, for example, the George Davis Senior Center hosted a watercolor class taught by Tesia Blackburn. STAR organizes small, informal evenings with artists in their studios where art lovers - and other Hunters Point Shipyard artists - can get acquainted and learn about new work in progress.